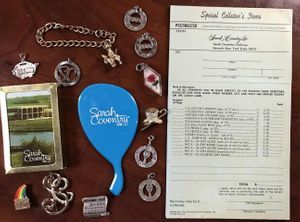 Sarah Coventry HOSTESS * Fashion Show Director * AWARDS * Accessories * Lot of 15 Pieces! 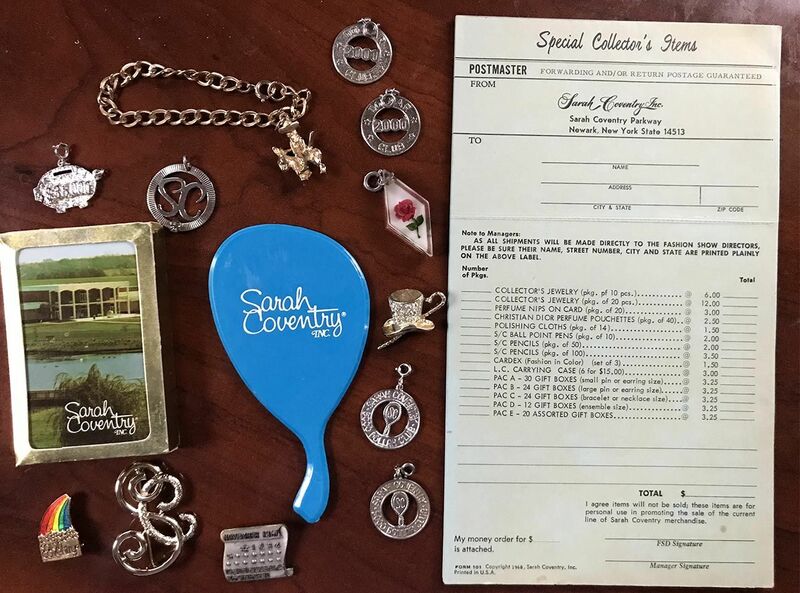 These items were all earned by SARAH COVENTRY Hostesses or Fashion Show directors. **CHARM - SARAH COVENTRY. BRIGHT AND TEXTURED SILVERTONE $35,000 PIGGY BANK - AWARDS CHARM. 7/8" LONG, 1 1/4" ACROSS WITHOUT THE RING. EXCELLENT CONDITION. NOT MARKED. **CHARM - SARAH COVENTRY. STERLING. FASHION SHOW DIRECTOR'S AWARD. SILVERTONE "SC 5" REPRESENTING 5 YEARS WITH THE SARAH COVENTRY COMPANY. 1 3/16" IN DIAMETER. GOOD VINTAGE CONDITION WITH SOME CHIPPING TO THE "S" AND "C". **PLAYING CARDS - SARAH COVENTRY. A PROMOTIONAL ITEM GIVEN AWAY BY THE COMPANY. EXCELLENT CONDITION - CARDS ARE IN A SEALED CELLOPHANE PACKAGE. THE BOX SHOWS A LITTLE SHELF WEAR BUT NOT BAD. **PIN - SARAH COVENTRY. GOLDTONE AND ENAMEL RAINBOW SALES AWARD PIN. 1 1/8" LONG, 13/16" ACROSS. VERY GOOD CONDITION. **PIN - "SARAH'S ACTIVITY PIN" - HOSTESS PIN. GOLDTONE/SILVER SC. THIS PIN WAS EARNED BY ACHIEVING 10 CONSECUTIVE WEEKS OF SALES OF $50 OR MORE EACH WEEK. VERY GOOD CONDITION. **PIN - SARAH COVENTRY. FASHION SHOW DIRECTOR'S AWARD. "SARAH'S MILLION DOLLAR WEEKS: NOV 6-18, 1967". 1" LONG, 1 3/16" ACROSS. HEAVY. VERY GOOD CONDITION WITH SOME MILD DISCOLORATION ON THE BACK. **BRACELET - GOLDTONE WITH DONKEY AND RIDER. THIS ONE ORIGINALLY HAD MORE CHARMS OR THE INDIVIDUAL CHARMS WERE EARNED - I AM NOT SURE WHICH. **MIRROR - SARAH COVENTRY TURQUOISE PLASTIC MINI HAND MIRROR. 5" LONG, 2 3/4" ACROSS. VERY GOOD VINTAGE CONDITION - SOME MINOR SURFACE SCRATCHES TO THE MIRROR AND A VERY SLIGHT BIT OF DETERIORATION AROUND THE EDGES OF THE MIRROR. **AWARD CHARM - SILVERTONE DISK WITH "2000 DOLLAR CLUB". ABOUT 1" IN DIAMETER WITH A SPRING CLASP. VERY GOOD CONDITION. THERE ARE 2 OF THESE - ONE IS NOT AS BRIGHT AS THE OTHER. **CLEAR LUCITE PENDANT OR FOB FOR A KEY CHAIN. ROSE INSIDE THE CLEAR DIAMOND SHAPE. **PIN - SARAH COVENTRY. GOLDTONE CANE AND TOP HAT ENCRUSTED WITH CLEAR RHINESTONES - PROBABLY AN AWARDS PIECE. 1 1/8" LONG, 1 1/4" ACROSS. VERY GOOD CONDITION. MARKED "SARAH COV". **CHARM - SARAH COVENTRY. "SARAH COVENTRY 5000 DOLLAR CLUB" IN SILVERTONE. 1" IN DIAMETER. EXCELLENT CONDITION. THERE ARE 2 OF THESE - ONE IS DISCOLORED.